Recently I met a beautiful woman in Second Life. Ok, she was someone’s avatar, but still beautiful. When I tried talking with her, however, I learned she was Romanian and knew little English. I had similar experiences with two other avatars the same morning. One was Swiss and the other Brazilian, but none of us knew enough of the other’s language to speak. 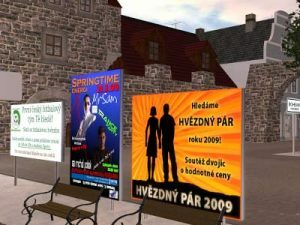 About 54% of Second Life members live in non-English speaking countries. Most speak widely used languages like German, French, and Spanish, but others speak languages such as Portuguese, Turkish, and Korean. Many also speak English, but often not well. How do we communicate with them when we meet them? We can and should learn foreign languages, but no one can learn them all. Is there another way? Yes. Over a half dozen automatic language translating HUD’s are available in Second Life. Some of them are free. Each of them translates at least 32 languages. The odds are that one of them will work for you. They only translate typed text at present – automatic translation of speech will be a major technical challenge – but they should allow you to hold a basic conversation in a wide variety of languages. I’ve tested seven of the automatic translators that are most commonly available in Second Life They range in price from free to 500 Lindens. One of the free translators rivals the most expensive for quality in basic functionality. Before buying any translator, be sure to test its HUD on your screen in ALL positions. I found this a particularly aggravating weakness of a few translators. For example, I might specify that I wanted it in the upper right, but some translators would either position it elsewhere on the screen, or not at all. Also be certain that the HUD isn’t partially covered by the side or bottom of the screen, as happens in a few translators. Check all screen positions. Toggling between automatic language detection and a specified language. Toggling object translation on and off. Anti-spam filter to block repeating statements when you speak in the target language. If you are not a native English speaker, does it offer a HUD or help in your native language? I found MH Translator extremely frustrating. The HUD position was wrong or simply didn’t work for most positions, and I sometimes had trouble getting it to translate, probably because in certain positions, some HUD menu choices are hidden from view. These both offer a very nice compromise between the more complex HUD of X-Lang and Q-Translator and the streamlined HUD of Ferd’s Free and Simbolic Translators. Of all the translators, this is the one that was easiest to use without experience and without reading help. As much as I like these two translators, I do have two complaints. One is that when the HUD is placed on the left and center bottom of the screen, Second Life’s chat bar partially covers it. The other complaint is that neither version displays your current language selections. This is not a problem if you always use the same languages, but if you or the people you are listening to use more than one language, it can be a nuisance. Anti-spam option on Pro version. This otherwise really nice free translator has one big problem: HUD positioning is terrible. For most positions I tried, the HUD either ended up in the wrong position or vanished completely. It’s compounded by the fact that when its position in the center or bottom of the screen, the drop down menu is cut off and several languages become impossible to select. If you don’t need non-English help or HUD, or other features of more full-featured translators, this one is for you. I was amazed by it. It’s intuitive to use, it toggles object translation, and it works in no-script areas. It’s the one I found most natural to use, and boasts some useful features not found on the others. I found the automatic language detection reliable when its set to its default of detecting the language of the other speaker’s viewer. Currently SL has viewers in Chinese, English, French, German, Japanese, Korean, Portuguese, and Spanish, so these are the languages that Ferd will identify most reliably, as long as the speaker’s viewer is set to the language he/she is speaking. Everyone in Second Life should have a translator. If you don’t feel like paying for one, get Ferd’s Free Translator or the Simbolic Translator. They’ll both do a fine job. Everyone in Second Life should have a translator. If you don’t feel like paying for one, get Ferd’s Free Translator or the Simbolic Translator. I had a problem with Simbolic HUD placement, but otherwise it worked fine. I loved Ferd’s. It’s the one I’ll be using most of the time myself. I’ll also use X-Lang for those occasions when its features are useful. But Q-Translator and AF Translator both deserve consideration. AF-Translator Basic was initially my favorite, but its inability to display the current lanugage settings became a nuisance for me. Still, for the price, it merits consideration. The Q-Translator’s numerous features make it a formidable competitor. Try all of them before making a decision. Thanks so much for these reviews! After yesterday’s horrific experience using the prehistoric Babbler during an awkward session with a foreign language client, I am ready for a different translator. That’s actually what prompted me to do the reviews. I used to use Babbler also. It was a fine product for its time, but the HUD was too confusing for just occasional use. I wanted a translator with a HUD I could use just occasionally and not have to try to figure it out all over again each time. My translator (Ferd’s Free Translator) was intended for total beginners to Second Life, and I hoped it would still be useful to the more advanced user. So thank you for the nice words in your review. It can be found at http://www.xstreetsl.com/modules.php?name=Marketplace&file=item&ItemID=1138681 It is set to $1 so that it can be gifted. $3346 has been raised in the last month for a worthy charity. Also, Second Life Mentors can give you a copy, as they get XFER/COPY permission. The web site help link ( http://secondlife.mitsi.com/secondlife/xlate/ ) in Ferd’s Free Translator has a machine translation of the notecard in all 41 languages. I thought that adding 41 notecards was not useful. I am working on the next update to internationalize the HUD, and allow it to be used for an entire room. If any readers have comments on new features, please post it, I will be happy to consider any and all requests. Please add to your list the HR Universal Language Translator from Hank Ramos. Hank used to sell his Translator for $500 Linden, but recently dropped the price in-world to zero. It goes for $250 on xstreetsl.com. It is also an excellent translator with many expert level features. Thanks so much for telling it like it is on translators. I happen to be Ferd’s SL Partner and watched him diligently work for months on Ferd’s Free Translator..which we refer to as the xlator. 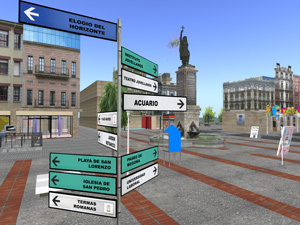 And yes, SecondLife does need a reliable…simple…small translator for meeting our neighbors all over the world. From what i’ve seen so far though….Ferd is constantly revising and upgrading his translator and input from users is the best way to accomplish a GOOD upgrade. So please keep US informed about any problems that occur with Ferd’s Translator and i know i can promise you …. it will get only better because this translator was developed from the heart …to Help people communicate all over the WORLD. My thanks to everyone who has commented! Frodo: I hadn’t thought to try that. Thanks! Still, one of my basic criteria was that the translator be as intuitive as possible for an inexperienced SL member. I’ll mention your tip when I do my next review, but I would still mark down a translator with a HUD that wasn’t intuitive for typical SL resident to use. First thanks Appollo, very nice to find a review of all translators of SL, waited for that for a long time. However I would like to make some corrections, I contacted you some weeks ago (03/17/2009) to let you the time to fix wrong statements. Well I can understand you need time to fix it, but sure you will understand I cannot wait months either. Translates 39 and not 41 languages, X-Lang doesn’t support correctly Arab and Hebrew. HUD interface in 8 languages and not 15. X-Lang have only interface in 8 languages (English, French, German, Italian, Dutch, Polish, Portuguese, Spanish). Actually neither the name of languages, neither the messages are localized. Auto-detects language for others only. Thus if you switch of language while talking, X-Lang will fail. “This is one of only two translators to position its HUD without any problems”. Well Appollo I’m very curious how you make your test, I personally totally disagree with this statement. Not only I’m the first translator HUD that integrate an auto-position feature to help user not loosing their HUD. But that feature was found so helpful that some a my competitors like AF Translator / X-Lang just integrate the same feature into their translator after seeing mine. I was not able to figure out any of the trouble you have with AF which position itself very precisely, but actually Q-Translator and AF are more precise than X-Lang on self position. They both take care of the media bar for bottom right. They both have an option do disable the auto position. Not only the interface is fully localized (buttons name of languages) but also all the messages. Auto-detects languages separately for both others and me. Price is not 370L$ but 290 L$. Translates 40 and not 42 languages, MH doesn’t support correctly Arab and Hebrew. Translates in 30 languages and not 32 languages. Simbolic doesn’t support correctly Arab and Hebrew. It works in no-script areas. This is really not particular to Fred translator. All others have the same feature including AF, MH, X-Lang, Q-Translator, Simbolic. Sorry to say Ferd what you claims on your web site “Works in no-script zones ! Other translators will drop dead or only half-work” is simply wrong. X-Lang, AF, MH, Q-Translator has same feature. In fact Q-Translator has been the first one to fully translate in no-script area in mid December 2008. X-Lang was the first one to have a full working HUD in no-script areas. Wrong: Allows 16-way chats in up to 39 languages and not 34. Ferd doesn’t support correctly Arab and Hebrew. Missing an important feature. Actually Ferd is the only one to show “accuracy” of the last translation. On one side translators like AF, MH, Q-Translator, Simbolic, X-Lang gives translation to others through public channel. On the other side translators like Ferd, Hank Ramos gives translation to others through instant messages. One may think IM is a much better solution cause it is far less spammy that public channel. This statement is true, but it have a strong draw back : actually requests are throttled to a maximum of 25 requests per 20 seconds per object. The IM solution needs to manage much more request to handle translations for others. Use Ferd translator in a place with more than 10 avatars and you fall quickly into the throttle. The translator just stop working. Hank Ramos try to improve that drawback sharing the translations between different HR translators on same place, but still translators using public channel will always be more reliable in a talk active region. Let makes a simple try with 10 avatars using different languages. Ferd will simply stop to work after translating very few sentences. I agree with Ferd, might be fair to add Hank Ramos one. Even if Hank didn’t login since 2009/2/26, hope nothing bad happens to him cause Hank is a very nice guy. мм… актуальная тема 🙂 ..
Second Life Mentors and Lindens can now Transfer/Copy Ferd’s Free translator to anyone by touching a prim in the SLVEC sim. This feature includes use in all of the Help Islands. The HR Universal (Hank Ramos) translator should be included. I sent Hank my no-script and auto-hud position code, and now I believe it is in many ways the best translator in SL for experienced users. Buy it from the xstreet site, it’s only a US dollar, and Hank needs the money. I don’t. I have noticed and basically ignored until now that the Q-language owner, Lalwende Leakey, has called me a liar in her in-world notecards and on this blog. To quote… “Ferd you can always lie about your competitors… don’t think this the good way to go.”. This is quite insulting, and inappropriate. For one thing, I never said a word about others. For another, we don’t compete. My product is free, and hers costs $390L. “Q-Lang:Be aware there are some limitations, HUD interface will not work for instance.” from Lalwende Leakey’s own web site. Also, the no script feature in the Q-language actually started to work on version v0.26 on 04-03-2009, according to her own translator notes. Her web site update needs updating, now that it works. Simbolic does not support no-script, either. Language counts: The Ferd Free Translator will detect over 150 languages, and it will translate 42 language pairs. The Q-lang, unlike almost all other Google-based translators, supports only 41. Why? Q-Lang does not support Taiwanese. It is as if a free nation of 22 million free people did not exist. Could this be because Lalwende Leakey is Chinese? There are over 150 language detections and a scanner display in Ferds’ Free Translator, that are displayed to the user along with distance, without using cryptic ISO codes. For example, the Q-Lang (and all others) show an after-the fact display of ‘sv’ (incorrect) for Finnish as spoken in Sweden, which is clearly not the same as a pre-chat hovertext saying ‘Finnish’. As another example there are over 20 Spanish and approximately 15 different English detections, all displayed as ‘English’ or ‘Spanish’. All other translators report only the 42 cryptic Google codes AFTER someone types, not before. Oops, except Q-lang. No Taiwanese. Auto-position: Auto-HUD positioning is a method of positioning the HUD correctly on any sized screen without manual intervention. The next SL release will cause HUD problems for Q-Lang in the near future: their auto position will not work on the bottom left and center. This may affect other translators that use auto-adjust, as well. Instant Messages Vs Public Chat: the conclusion Lalwende Leakey reaches is totally incorrect. The difference in IM vs Say is almost trivial, since the command simply changes from llSay to llInstantmessage. In fact, the Q-lang supports IM! I used Instant messaging because spam is not possible. The claim that a translator has ‘anti-spam’ features is misleading, at best, when it uses llSay. With IM, it is impossible to spam. Perhaps our definition of spam is different? Any limits to throughput on any translator comes from the HTTP throttle, which all of us have to live with. They are throttled to a maximum of 25 requests per 20 seconds per script, (see http://wiki.secondlife.com) and this is not applicable in any way with, nor should not it be confused with Instant Messaging. Instant messaging has a 2-second delay per script. My translator has 16 separate outgoing scripts operating in parallel, one per outgoing message. Throughput is thus 16 outgoing messages in two seconds which is entirely adequate. Incoming auto-detection and owner translation is also done in parallel with all other operations. There can be no ‘less throttled’ method possible, as all HTTP Requests are run in their own script. Other Translators that use single threaded designs, such as the Q-lang, will suffer the most. Auto Detect will double the number of requests per second on any translator, and you will reach the throttle limit sooner. My translator allows you to toggle between ‘auto detect’ and ‘Viewer detect’ modes. Auto detect is extremely useful, but it doubles the number of HTTP requests. The user may toggle auto mode off and lock in their choice, and double the number of translations per 20 seconds that can be accomplished before SL throttles back as compared to auto-only translators. The comparison table at Lalwende Leakey’s web site, in-world, and on her Xstreet ad is totally misleading and untrustworthy: Eleven of the entries are totally incorrect on the column for Ferds Free translator. I can’t vouch for any of the other translators, but a 33% error rate on these rather comparisons is, to say the least, suspicious. I totally miss the most important feature: correct translation. For everyone to understand very you clearly Ferd, tell us who are those many others ? Actually all main translators of SL including AF, MH, Q-Translator, X-Lang fully work in no script area. Thus explain us who don’t actually ? When I read that on your blog I was so surprised that I cannot figure out how one can claims this without lying. If it was just a mistake, well fix it. Ferd Frederix: From the AF Translator XstreetSL ad: “Now continue to work in no-scripts areas. Buttons do not work but can be managed using chat commands.” “Q-Lang:Be aware there are some limitations, HUD interface will not work for instance.” from Lalwende Leakey’s own web site. Also, the no script feature in the Q-language actually started to work on version v0.26 on 04-03-2009, according to her own translator notes. Her web site update needs updating, now that it works. This is not because our HUD interface was not responsive until recently that our translators didn’t work in no script area ! What started to work with v0.26 is the HUD interface not the translator. To be very precise Q-Translator started to work within no script areas since the v0.17 released the 10-23-2008. AF translator was doing the same several days after. Both of us translated into no script areas since that date. And we give both commands to user to control all the features of our translators. Neither AF or Q-Translator drop dead ! A recent change in Second Life Viewer allow us to give complete access to HUD interface. The first one to use that new feature was Codee Nishi into X-Lang 0.6 in end of January. MH / AF / Q-translator follow in that order in February. Ferd you now are aware that your statement is totally wrong. Yes Simbolic and Hank Ramos don’t work in no script areas. Thus be precise or say nothing. For helping everyone doing a mistake between languages and characters sets. There is actually no translator within SL supporting Taiwanese. The words “simplified” and “traditional” refer to the characters used, not the language that’s written in them. Google translates into Mandarin and Mandarin Only. The simplified character set is mostly use in Republic of China, Singapore, Malaysia, the traditionnal set in Taiwan, Hong Kong and Macau. About 70% of the people in Taiwan belong to the Hoklo ethnic group and speak both Standard Mandarin (officially recognized by the ROC as the National Language) and Taiwanese Minnan (commonly known as “Taiwanese”; a variant of Min Nan spoken in Fujian province). Standard Mandarin is the primary language of instruction in schools; however, most spoken media is split between Mandarin and Taiwanese. The Hakka, about 15% of the population, have a distinct Hakka dialect. Aboriginal minority groups still speak their native languages, although most also speak Mandarin. English is a common second language, with some large private schools providing English instruction. English is compulsory in students’ curriculum once they enter middle school. English as a school subject is also featured on Taiwan’s education exams. Taiwanese Min-nan is a variant of the Min Nan Chinese language spoken by about 70% of the population of Taiwan. This language is absolutely not supported by Google. Min is the only branch of Chinese that cannot be directly derived from Middle Chinese. This may account for the difficulty in finding the appropriate Chinese characters for some Min Nan vocabulary. This is maybe also part of the reasons why it is almost totally mutually unintelligible with Mandarin or other Chinese dialects. Q-Translator 0.26 supported both “Simplified” & “Traditionnal” characters as source character set for Mandarin. Q-Translator 0.27 supports both “Simplified” & “Traditionnal” characters as target character set for Mandarin. Well, hopefully, we have found a neutral forum to discuss translation issues in Second life. Thanks for clearing the Mandarin vs Chinese confusion up, Lalwende Leakey. Hey you guys see to be disagreeing a lot and I couldn’t get past the technical jargon. I just need to know: which translator can I or should I use that would in IM? Sometimes I like to have private conversations but I would really love to be able to understand the myself. Just about all of them will work in IM. Mine uses the /1 and /2 commands. No script can read an IM, so you must copy the incoming text into main chat. Add a /1 to the beginning. It will detect, translate and remember the language. Type your response in after a /2. You can then copy the translated response back to your IM. Farsi ( Persian Iran ) is now supported by Google and the Free Translator. Which of these translators allow sending a free or low-cost copy to others? I know the Universal Translator does. The free Google translator (not reviewed above) doesn’t but you can send landmarks to where you can pick one up. Unfortunately, it sends one to everyone in chat range, as I found out at a crowded infohub. Thanks for the useful review, and a well-written blog that I had missed. The thread shows that all parties have good, no–great intentions, and that perhaps that trouble/drama only comes when one falls into the trap of presuming bad motives from others without first checking things out in a neutral way. Much was explained in this thread, and I’m thrilled to now leave the Babbler (which was good!) behind for improved translation. Thank you *so much* for making these tools. They make a better virtual world–is there any doubt about that? to be effective and usable and only one so far that can make me understood in Japanese !!!!! While this review was helpful as far as it went, I’m a lot more interested in accuracy of the translation. I’m far more interested in something that can give an understandable translation than in how it’s HUD shows up. Any recommendations for (un)translating other people’s chat? There’s de-babbler but I always had problems with it. From my understanding all translators use the google website for the translation, so the accuracy will be pretty close in most of them. Translators are literal, they cannot take into account emotions implied, double meanings and of course will make some mistakes when a language has 10 ways to say hello. You mention problems with some of the translators hud positions. I just wanted to bring to your attention that just like prim clothing and other attachments in SL, all items attached to the hud are positionable. SL remembers the offset from the attach point just as it does for a sword in your hand or a belt on your waist. So screen position of the hud is not an issue. For example, you may attach something to the center position of your screen and then move it to the upper right corner via the edit menu. Or you may find that an object attached to the lower right corner of your screen is down to far. Just edit it and move it up as much as needed. Screen resolution plays a part in this as well. Someone developing a hud in one resolution may position it just right for his screen while that same offset on your lower resolution may cause it to be partially (or even completely) off screen. If an attached object does happen to be completely off screen, you can still get it back into viewing range. You can either attach it to a different location and then move it around via edit mode and retry. Or, while in edit mode, scrolling the mouse wheel will cause a copy of your viewing window to shrink down, allowing you to see all items attached to your screen, even ones that happened to end up far outside your viewing range for whatever reason. Sorry for the longwinded comment but as you can see, location of items onscreen is no cause for concern. Wow, guess I’m late to the party! Thanks for including my translator in the discussion. It is true, that many of us use the Google back-end for translations because it’s technically easy for LSL scripts (we can process everything in-world) to work with and the translations are pretty good as far as machine translation is. Just to throw my ideas into the hat: each of the translators are fundamentally the same but differ in their feature set and how they go about presenting translations to the users. The translations themselves are almost identical, though I know the Q Translator does some extra processing to look for typos and such. 2. Have nothing to configure. 3. Simply forget that it is there. To that end, my interface design is designed to automatically detect people’s languages, handle all the basic translation stuff with Google Translate, and then intelligently route translations to those that need them without upsetting people by spamming them with unnecessary languages dumped into public chat that they don’t understand. My rule is that if you don’t speak a language, you shouldn’t see translations into that language. You should only see translations into your language. From a technical perspective, I am able to get around the HTTP requests rules not by cheating or “code hacks”, but by building a sub-system into the translator that allows copies of the translator (worn by others or rezzed on the ground) to work TOGETHER. Rather than having translators working idependently in the same physical space, there is a sophisticated, hidden, and encrypted back-channel that nearby translators employ when they notice another one or a group of translators. One translator is elected the master, and then works to handle the workload of translations and spread the work. When one of the translators leaves, the back-channel network of translators automatically compensates and regroups. All of this transparent to the user. I think I have achieved this goal of ease-of-use (for newbies and non-technical people), transparency, and speed. The Hank Ramos Universal Translator is now open source. (See the LSL Wiki Script Library) Hopefully this will encourage other translators to open their source or to collaborate together to make a better system with the best that each of our’s has to offer. Fantastic review. Thank you. One small suggestion: the metaphor “Cadillac of translators” might be reworked to be understood by a broader audience? The comments section is as helpful as as the main article, and evokes the joy possible in connecting across barriers, and letting go of competition a bit, to collaborate and help others to feel this joy of connection. We all need help to clarify and understand each other, to work through misunderstandings, and to uplift and respect each other. Keep going good people! So all the translators are now dead due to the greed of Bing (Microsoft) and Google.